Hello Friday! I thought that in honor of the weekend (and also due to my inability to really focus on writing anything of major substance yet) that I would do a giveaway! Everyone loves a giveaway, especially when it involves some type of food, so this should be a great way to head into the weekend. 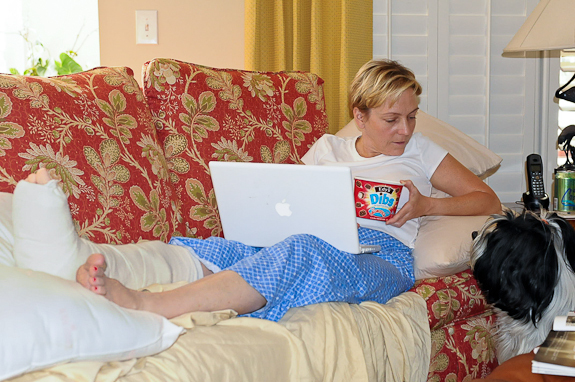 If you are a regular reader of Bunkycooks, you will probably know that I had ankle surgery this past Monday. It’s been a long and foggy headed week. I am feeling marginally “of sound mind”…just enough to be able to write this post and share a recipe to go along with it. Sitting around eating bon bons is not all that it’s cracked up to be…ask my dog! The Chobani yogurt people sent me a nice sampling of their Greek yogurt several weeks ago. They had invited me to meet them at their Chomobile, while it was in Atlanta, but I was out of town (Bummer, dude! ), so I was able to play with some of the different types of yogurts at home instead. 🙂 I like the idea of including more yogurt in our diet because we are always looking for ways to eat lighter and healthier foods. According to their website, they have some guy by the name of Mustafa at their farm in Upstate New York. He is the Master Yogurt Maker. Isn’t that the name of the lion in The Lion King? I told you I wasn’t totally coherent…just my brain wandering again …and that’s a scary thought with my pain med allotment circumstances this week! So anyway, I have been enjoying their fruit flavored Greek yogurt since I first discovered it in the grocery stores (I particularly like the wonderfully tart, pomegranate flavor), but I had not tried the plain yogurt to use in any recipes, so I was excited to get to work on that! I find Greek yogurt to be more satisfying as a meal or a snack than regular yogurt because of its rich consistency. I like the smoothness of the Chobani yogurt (no lumpy stuff, even when the fruit gets mixed in) and there are fewer grams of sugar, which is always important. It also has twice the protein of regular yogurt and offers some other great benefits as well. If you are concerned about your foods (as I am), and want to know what is in them and where they come from, you might want to compare labels on yogurt next time you are making a purchase. I had substituted regular whole milk yogurt in the past for sour cream and had okay results, but the Greek yogurt has such a nice consistency in even their non-fat version, I thought I would try it to update a few recipes. I knew the smoothness and tartness of the Greek yogurt would make it a better substitute for sour cream. These two ingredients are about to make a really lovely dessert! I made several main dishes that were very successful substituting Chobani Greek Yogurt for the sour cream, however, I decided to share a dessert recipe, since we all seem to love desserts more than main dishes! This dessert was inspired by an older recipe at Gourmet that was nice, but I thought could be kicked up a few notches!. I love the flavor of the Grand Marnier with the oranges and the tartness of the yogurt. A little bit of booze is always a nice addition to dessert. It’s hard to go wrong with a liquored up dessert, wouldn’t you say?! This is a delicious, low-fat dessert that is elegant enough to serve to company. The first time I prepared the recipe, I unmolded it like a panna cotta. The second time I made it and served it in the dessert glass. Either presentation is lovely, so it’s a matter of personal preference which you choose to do. If you are in a hurry and make several of these for a dinner party, serving it right from the glass would certainly be simpler at the end of a meal. You can serve this as a traditional panna cotta, if you prefer. Now for the important stuff – the giveaway! Leave a comment on this post telling me what your favorite flavor of yogurt is! Here are four additional ways that you can enter. 1. Follow @bunkycooks on Twitter. Leave a comment here indicating that you are now a follower. If you are already a follower, you can leave a comment saying you are. 2. Tweet about this giveaway. Here is the link to tweet http://tiny.cc/uqm7d. Leave a comment and tell me that you have tweeted it. 3. Become a fan of Bunkycooks on Facebook. Leave a comment here indicating you are now a fan. If you are already a fan, you can leave a comment saying you are. 4. Subscribe to Bunkycooks by RSS feed or email. Leave a comment saying you are now a subscriber. If you are already a subscriber, you can leave a comment saying you are. *** Please be sure to leave separate comments as they are easier to count! Thanks! The more times you leave a comment, the more chances you have to win! That would be 5 chances total (but, who’s counting?!). I will be using random.org to pick the winner. This giveaway ends at 5 pm EST on Friday, November 19th. I will notify the winner by email. Please get back to me with your mailing address within 48 hours. These coupons will be mailed to the winners directly from Chobani. Chobani is only available to purchase in the U.S., so regretfully, this contest is only open to residents of the U.S. I apologize to my friends elsewhere. In the meantime, I hope you enjoy this recipe and good luck with the giveaway! AND THE WINNERS ARE KRISTINA@SPABETTIE AND CRISTINA@TENNIECAKES! CONGRATS! I HAVE EMAILED YOU BOTH. This recipe makes one serving, so you will need to adjust the ingredients accordingly, for your desired number of servings. Whisk together yogurt, sugar, vanilla and orange zest in a small bowl until sugar is dissolved. Put water in a very small saucepan and tilt pan so that water is on one side, then sprinkle gelatin and cardamom evenly over water. Let stand one minute to soften. Heat mixture over low heat, stirring, until gelatin is dissolved, about thirty seconds. Whisk hot gelatin into yogurt until combined well. * Do this step quickly so the gelatin does not have time to set up. Pour yogurt into ramekin or dessert glass and chill, covered, until set, about one and a half hours. Bring orange juice, Grand Marnier and honey to a simmer in cleaned very small saucepan, stirring, then simmer until reduced to about one tablespoon, about one minute. Pour syrup over segments in the bowl, gently stirring to coat. Cool to room temperature, about ten minutes. If unmolding - Run a thin knife around edge of ramekin to loosen panna cotta, then dip ramekin into a bowl of hot water thirty seconds and invert pudding onto a plate. 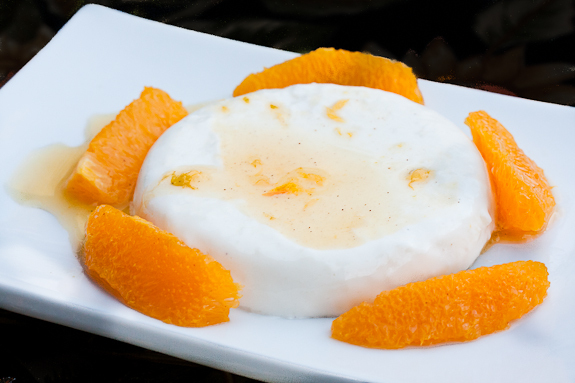 Spoon syrup over panna cotta and arrange orange segments around sides. 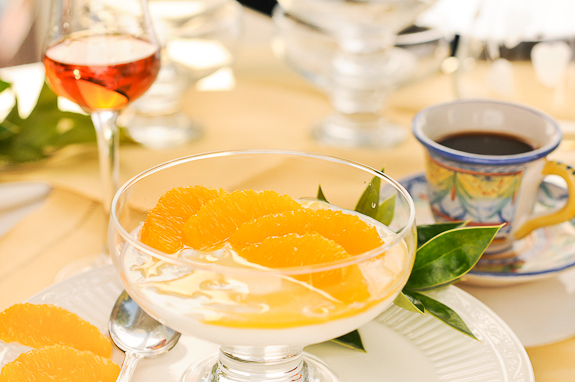 You can also serve the panna cotta in a dessert glass and pour some of the syrup over the top and arrange several orange slices on top of the dessert. * Disclaimer – Bunkycooks receives no compensation for the use or endorsement of Chobani Greek yogurt. We support the products that we use and love. Love the recipe AND the pedicure! Hope you are feeling better soon. my favorite chobani flavor is pomegranate or blueberry! YUM ! Favorite yogurt this week would be….Pomegranate, as well as favorite ice cream, liqueur, margarita, garnish, and vinaigrette! LOL! Good choice! Did you notice what my favorite yogurt flavor is? Pomegranate! Never mind my favorite yogurt flavor, I hope your feeling better PDQ! I like mixed berry or strawberry. Hey Gwen…I’m glad you have to take it easy so that you’re on the mend, but I do hope you’re feeling much better. On another note – fantastic giveaway…I luv Chobani! Discovered their yogurt in the summer and now we purchase it by the case at Costco. I haven’t seen the Pomegranate flavor…but I guess from what I’ve tasted so far, the strawberry. But of course…I’m already a fan on Facebook! You’ve been in my Pageflakes reader (however having serious issues w/Pageflakes these days). I think I’ve exhausted all my opportunities now. Now here you have me…I ‘m not only an addict to Greek yoghurt (though I had to quit bec’ it does add weight on you! shhh don’t tell the sponsors) but also an addict to Grand Marnier (this also adds pounds on you but there, I’m not ready to quit ;D ), so this is great!! You look so chic with your leg in a cast!! Hope to see you running soon! I can’t participate but I couldn’t help but leave a comment. I recently made Lemon pannacotta with lavender cream.. with yogurt and really loved it. You have used my fav spice cardamom in this one with those zetsy flavors I’m sure it would have been a hit! Hope you are getting better after the surgery. All of us at my house love Chobani Yogurt. About a year ago, I converted my youngest over to it from the sugary kids brands and he goes for it big time. I love the pomegranate but enjoy them all thanks to the availability at Costco. Looking forward to trying the new flavors! Dibs probably make the fact that you can’t walk very well right now a litttle bit better 🙂 And you still managed to post a lovely panna cotta! This is one dish I’ve never tried.. maybe its about time I do! Your panna cotta was such a stroke of genius, I am going to have to try it soon!! You sweet woman! I’ve been thinking about you and your recovery everyday. I’m hoping that you continue to improve. 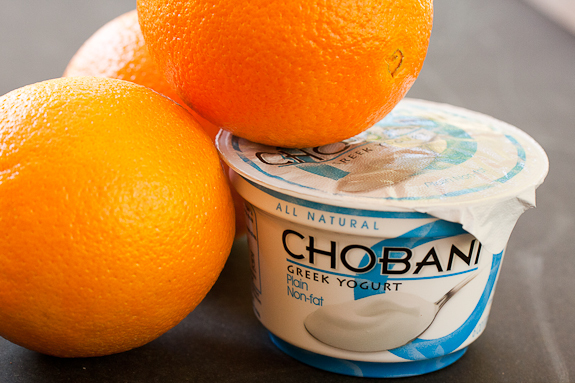 I love chobani Greek Yogurt (and I prefer the plain!). Your panna cotta is so inspired, my friend. Just beautiful. Thank you for sharing. I like you on FB, too! Hope you’re feeling better and will be able to get up and around soon. My favorite yogurt flavor is the Chobani pomegranate. I like plain yogurt. I use it for alot of greek inspired salads. During Thanksgving try adding some yogurt to mashed potatoes instead of sour cream. YUM Plus, plain yogurt is a fun addition to some baked goods. Love, love Chobani! Only yogurt I eat any more. Oops, favorite flavor is pineapple & am following you on twitter! You’re now in my Google reader! My favorite flavor is strawberry-with chocolate granola! I also now follow you on Twitter and Liked you on Facebook!